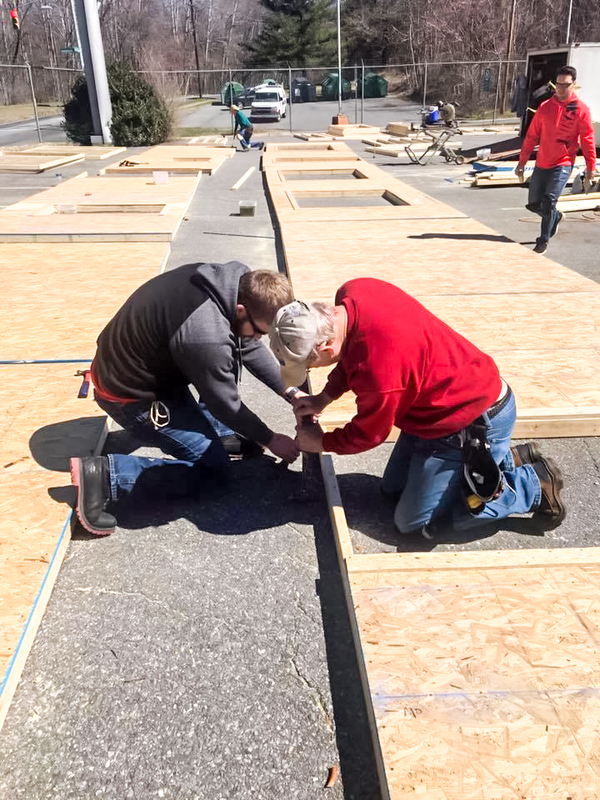 For Faculty Advisor Allison Pettit and her crew of students involved in Liberty University’s Habitat for Humanity club, the 2018-19 school year has been full of exciting and unexpected financial blessings. Recently, Pettit and the nearly 60 students involved in the club learned they were rewarded a $1,000 grant from Liberty University’s Student Government Association (SGA). According to Pettit, the funds will go directly into the club’s fundraising goal for the spring, which totals $20,000. The money the Habitat club received from Liberty’s SGA will play a part in the club’s goal of matching a State Farm grant received prior to the start of the 2018-19 school year. In August 2018, Pettit learned that Liberty’s habitat club was chosen to receive a $20,000 grant from State Farm, along with Habitat clubs from Clemson University and Purdue University. However, in order to receive the grant from State Farm, the club must match the grant amount and raise $20,000 by May 15. As a result, the club has been hard at work fundraising since the beginning of the fall semester and will continue throughout the spring semester. During the spring, the club plans to host a golf tournament April 12 and will also receive donations from the annual FACS fashion show April 6. The Liberty Habitat club partners with the Greater Lynchburg Habitat for Humanity (GLHFH), which was founded in 1988. For more than 30 years, the GLHFH has been dedicated to providing affordable and sustainable housing for low-income families in the Lynchburg area. The Liberty Habitat club has contributed to the building process of two of the more than 300 homes built through GLHFH. More than 100 families apply for Habitat houses each year in the area, according to Pettit. A common misconception about Habitat is that families are just given the houses, but this is actually not the case. Families chosen to receive a Habitat house are responsible for paying a monthly mortgage for the home. According to the GLHFH, more than 220 families have paid off their mortgages for their Habitat houses. According to Pettit, the club hopes to begin construction on the third Liberty Habitat home in August in order to have the family in the new home by Christmas. Students will have an active role in the construction of the home and will work alongside the builders swinging hammers, putting up walls and overseeing the project from start to finish. HANDS ON — GLHFH has built over 300 homes since 1988. “It’s been a great impact on those families and for me too to see that, with a group of students, we are able to build that home,” Pettit said. Prior to coming to Liberty, Club President Madison Sumner was familiar with Habitat for Humanity through a friend’s father, who is an executive in the nonprofit. Sumner took an active role in the Liberty Habitat club since she first heard about the club her freshman year and was offered a leadership position in the club early on. Sumner looks forward to seeing the fundraising and building process come to fruition. “Our hope and prayer is that even with this (grant from SGA) and all the other fundraisers we have going on this semester, we’ll be able to hit that goal and build in the fall and get the family in the home by Christmas,” Sumner said. According to Sumner, it has been rewarding for herself and the other club members to witness the lasting impression a Habitat home can have on a family. Sumner said it is rewarding to see the families find stability in their new homes and enjoy benefits that many take for granted, such as feeling safe in a neighborhood or having a yard where children can run and play. Students in the Habitat club have a unique opportunity to take part in the process from start to finish and build relationships along the way. Students interested in joining the Habitat club in their mission to raise $20,000 can follow them on Facebook at Liberty University Habitat for Humanity Club. For further questions or to get involved, contact Allison Pettit at adpettit@liberty.edu.